After a 3 year hiatus from the Hollywood limelight, Jamie Foxx is finally back and he's badder than ever. 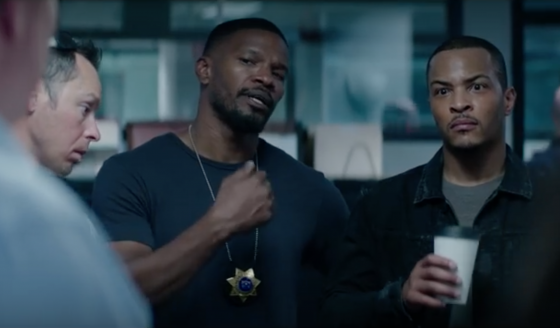 Looking more physically fit and definitely sweatier than ever before, Foxx becomes a verifiable action star in the vein of John McClane or other cops thrown into dire situations with guns and shady dealings. Sleepless is an action packed blast to the face that never lets up. This is pure escapist cinema armed to the gills with bloodshed and neverending hand to hand combat sequences. Tables are shattered. Cars are squashed. Human lives are vanquished with no remorse at all. Returning to this genre after his small leave of absence, Foxx feels right at home kicking the living crap out of drug dealers and bad guys galore. In an all out battle royale, Sleepless is a theatrical brawl that brutalizes every main player with bullets, fists, knives, vehicles and more. Of the big releases this weekend, it's easily the most fun entry you'll get. Immediately kicking off with a familiar tale of dirty cops and drug deals gone bad, this flick is a powerhouse of beatings and human carnage laced with great villains and a few silly twists along the way. While the writing staff is never going to win any awards for this movie, Sleepless never takes itself too seriously. As an old school action thriller, it delivers on all fronts. In the casting department, the always impeccable Scoot McNairy knocks it out of the park as the main antagonist while a refreshed Dermot Mulroney carries his own as a sleezeball casino magnate. T.I. flatly plays second fiddle to Foxx and is quite obviously out of his element against career actors like Michelle Monaghan and David Harbour. Gabrielle Union just feels out of place with an underdeveloped character with too few lines and not enough to do. Her character is relevant to the plot but she's thrown into places and situations that feel forced and too contrived. This is T.I.. He should leave the acting to the professionals. Why? Cause he can't act. 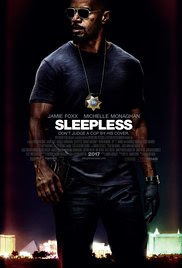 Sleepless is a remake of the French film Sleepless Night (Nuit Blanche) which I've never actually seen. However, it would be super interesting to watch it now. If this is half as good as the original source material (they typically never are), I'd have to imagine it would be equally as thrilling to watch. This version makes a great jump to domestic cinemas with a story that could take place almost anywhere in the world. It might not be the redefinition of action cinema, but Sleepless makes great use of its main actors, a bumping audio mix, and a cool movie about people bashing the hell out of each other with whatever tools are available. I had a chance to see this in the Dolby Cinema experience. That may have added to the luster of watching Sleepless. However, this is a solid winter release that should be getting more notice than it its. It's definitely way better than Live By Night.